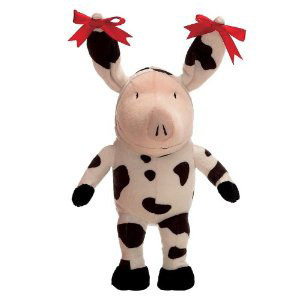 Today’s cow is a pig… in a cow costume! 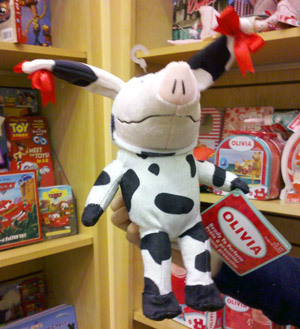 Our children’s world embraces animals of every kind, but I’m starting to see a prevalence for pigs and cows… and after today, for pigs as cows. 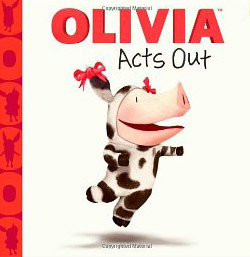 This doll was inspired by the book Olivia acts out, where Olivia tries out for the main lead in a school play as, you guess it, a cow! There you have it – not only does our own human society have a subconscious admiration for cows, but it looks like the pig world does too! Previous Post Count cow bells with Elmo! 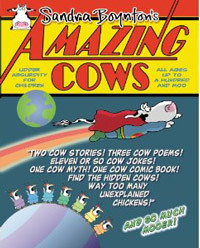 Next Post Food4Less means cows galore! Haha, I love your blog, Pedro! And I love your Holstein look. Is it OK if I use a picture of you on for my post today? You can suggest a specific one or I can just grab one from your blog. I do like cows because they’re such an interesting part of society, but I’m first a cat lover (with just one left now since my oldest left us earlier this year). 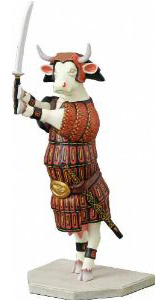 I can’t wait to show off Pedro the cow-spotted cat on my blog! Sorry I didn’t get back to you sooner – I was having a little cow nap. Absolutely, you can show my off in your blog. The more Pedro the Cow/Cat, the better! Don’t worry, Pedro, you’re not too late and are officially my cow of the day! Man, I love your Halloween costume!